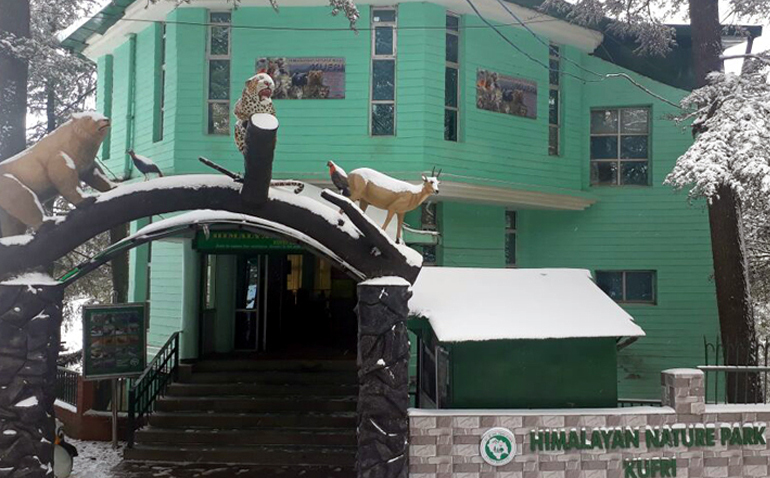 Himalayan Nature Park Kufri, popularly known as ‘Kufri Zoo’ was established in 1992. Prior to this area of the park used to be a Musk Deer Farm since 1965 managed with the objectives to breed musk dear in captivity, to study its behaviour and to conduct research on methods to extract musk without causing injury to the animal. Enclosures for musk deer were constructed to establish this farm. Since this farm started attracting tourists and subsequently other Western Himalayan fauna including Brown Bear, Kashmir Stag, Barking Deer, Sambar, Yak, Blue Sheep etc. were also added and independent enclosures were constructed for these. A pheasantry was also added where Himalayan pheasants like Monal, Western Tragopan, Cheer Pheasant, Kalij, Koklass and Red Jungle Fowl etc. were kept. In the year 1996, it was recognized as Himalayan Nature Park Kufri, by the Central Zoo Authority of India. At present ___ specimen comprising ___species particularly representing Western Himalayan fauna are housed in this nature park. Animals have been kept in big and naturalistic enclosures to the inhabitant animals.